Hit by balls, run over, kicked and thrown about; you need a piece of training kit that stands up to the physical demands of any action. Made by Mitre, this set of 20 Space Markers are a lightweight and flexible offering that take the knocks and ensure that training carries on to the final whistle. 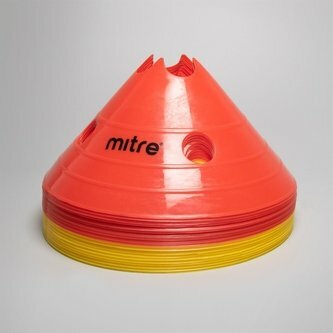 Measuring 19cm across, the two different colours (red and yellow) make them ideal for marking out pitches, training areas, footwork drills and a range of other sessions to keep players focused on their training. When done with training then the markers all fit together on a stand and can be stored inside the accompanying drawstring bag.